(Coed Entering 3 - 8) Watershed Discovery, Woodland Adventures, Environmental Science, and Wilderness Survival are just a few of the themes to be covered in Nature and Survival Camp. Campers will discover the ecology of watersheds. They will explore these areas while learning about how humans can impact them and the importance of keeping them clean. Campers will take part in hands-on labs involving testing water quality, acid rain, and performing a week-long study of aquatic insect life. Campers will also discover the world of forests with daily themes of mammals, birds, amphibians, reptiles, and insects by searching for salamanders, mammal tracks, box turtles, and more. Campers will also learn about the Native Americans that lived in Central NJ and learn some of the survival skills they developed. Activities will range from building shelters to making fire without matches. Outdoor Adventurer/Biking and Swimming….August 4-15 Have you ever wondered how to use a compass? Or, how to build a fire without a match? 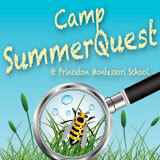 Children will play and explore as they become “Outdoor Adventurers” during this session. Our young naturalists will learn to rely on and hone their five senses as they explore some amazing aspects of the natural world. Riding a bicycle is a wonderful way for children to feel free and enjoy summer days. Do you remember playing in the “great outdoors” as a child? For a wide range of reasons, today’s children are simply not experiencing as much active play time as their parents did. In fact, a new term is used to describe this trend; it’s called “nature deficit disorder” (Richard Louv, 2008). Session includes weekly swimming instruction at the YWCA in Princeton. In the afternoons, we will enjoy team building activities and cooperative adventures as we learn to bike or hone our existing skills. Please bring bike to camp.